This is a fragment from a representation of the Crucifixion. The bearded Christ hangs on the cross in the centre of the panel flanked by figures of the Virgin Mary and St John the Evangelist. An angel kneels at the foot of the cross and a half figure is carved at the top right, both holding chalices. The bearded Christ, wearing the torse and naked but for the loincloth, hangs on the cross in the centre of the panel. His head is inclined to his right; his right foot is crossed over his left. The cross has a battlemented base. An angel kneels at the foot of the cross and the half-figure of an angel is carved at the top right; both hold chalices to receive the precious blood. The Virgin Mary, barefooted and wearing a gown with a cloak fastened with a brooch and which veils her head, stands on the left of the panel looking towards the cross, her hands clasped together. The beardless figure of St. John the Evangelist, barefooted and wearing a gown and a cloak draped from the left shoulder, is shown standing on the right of the panel. He rests his chin on his right hand in an expression of sorrow, his elbow resting on a closed book held in his left hand. He holds a palm pressed against his body with his left arm. The whole of the top left of the panel, the top right corner and a triangle above the head of St. John the Evangelist are missing. A break across the middle of the panel has been repaired. There are traces of red paint on the cloak of St. John and on the angels' wings. There are slight traces of gilding on the upper background. Some blue paint remains on the Virgin's cloak. The back of the panel is incised with three parallel strokes. There are two lead-plugged holes in the back. The bottom has been cut away. Acquired by Dr W. L. Hildburgh in London. On loan from him since 1929. Given by Dr Hildburgh in 1946. 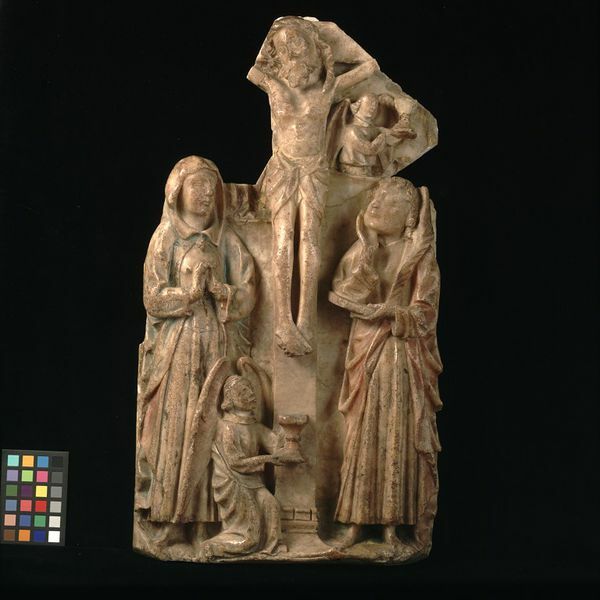 Alabaster panel depicting the Crucifixion. English, 15th century.